Between 2002 and 2004 I produced twelve water colour paintings which I hoped might be used in the design of a calendar. I went out and about at the beginning of each month and decided what flora and fauna might be of interest in a particular month and what would make nice little paintings to go on my proposed calendar. These 12 paintings have the codes NS01 to NS12 (‘NS’stands for Nature Series). However, when I designed and published the A4 limited edition calendar in 2005 for the year 2006, it ended up with the title: “Nature’s Gems”. All 300 editions were sold. And each year since then I have designed and produced a calendar based on my artwork done during the year, or re-using some popular pictures from previous years. The calendars remain as popular now as they were in 2005 and lovely people come back to purchase them year after year. The calendars have been sent all over the world. I also now produce A5 and Half A3 Calendars, as well as CD size calendars in a plastic case. Artist Code: NS05. Completed May 2004. Original SOLD. Water colour on Aquarelle Arches 100% Hot Pressed cotton rag paper. Unframed size 9″ x 12″. Framed size 21” x 17”. Selected for and SOLD at the National Exhibition of Wildlife Art (NEWA), August 2008. 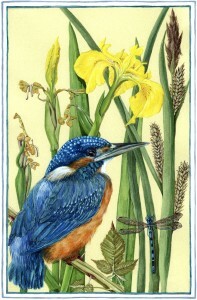 Kingfisher, Alcedo atthis, Yellow Flag Iris, Iris pseudacorus, Blue Damselfly, Libellula, Lesser Pond Sedge, Carex acutiformis. The kingfisher dashed passed whilst I was enjoying the sun in my little wild garden, he rested fleetingly on a bramble near my tiny wild pond (no fish), then whirled away out of sight. I sat wondering whether I had really just seen that! It has been back several times, but usually to my neighbour’s (much bigger—huge) pond with fish, but still flies occasionally through my garden, and probably has a fleeting rest when I am not looking. Of the twelve calendar pictures produced, this was my favourite and, when I decided to become a professional artist in March 2005, I used the kingfisher in my logo design. amongst the brambles, out of view. and other plants by water’s edge. And catches fish amongst the reed.